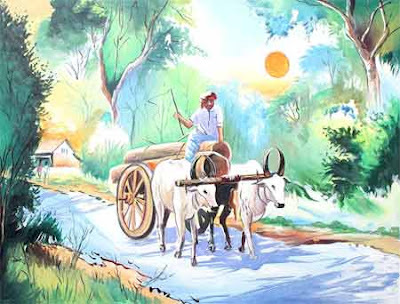 The story of King Janashruti taking lessons from cart puller is part of the Chandogya Upanishad. One day, King Janashruti was resting on the terrace of his palace; he saw two swans fly over. The swans were actually a sage and a deva in disguise. One swan told the other swan not to fly near the king and disturb him as his luminous spiritual power will burn anyone going near him without his permission. The swan told that the king acquired the power by offering food to all. King Janashruti, who overheard the conversation, was keen to meet Raikva. Raikva was finally found in a village. He was sitting under a tree and scratching his back. The king summoned Raikva and offered him cows, chariot and immeasurable amount of gold to take him as his disciple. But Raikva did not show any interest. The king then offered his daughter as his wife. Raikva rejected this offering too. The king then adorned the role of a servant and approached Raikva. On seeing the king’s unparalleled intent to gather wisdom, Raikva taught King Janashruti the Truth. He explained about the need to tame mind and to see the unity in all animate and inanimate.